Reading the title, I assume many of you will say that comparing Suzuki Raider/Satria/Belang with Kawasaki Ninja 250R is totally inappropriate. Well, in a certain point, I do agree with that. Looking to their initial specification (stock engine), it would be pointless to compare these two different creatures. 150cc DOHC 1 cylinder VS 250cc DOHC Twin Cylinders. 16hp VS 26hp. A cheap USD1900 underbone VS USD4500 Sport bike. What kind of comparison is that??? Yes, we know that we must do some changes/ modification in our engine to accomplish this goal. But in the other hand, we also don’t want to execute some extreme engine makeover which will turn our simple daily bike into some freaky drag bike engine. So, how extreme can we go? Fortunately, from my little observation, based on personal experience, you don’t have to go that far. Suzuki Raider/Satria FU/Belang R150 has more than enough potential that only needs an easy simple modification inside the engine to gain significant performance enhancement. 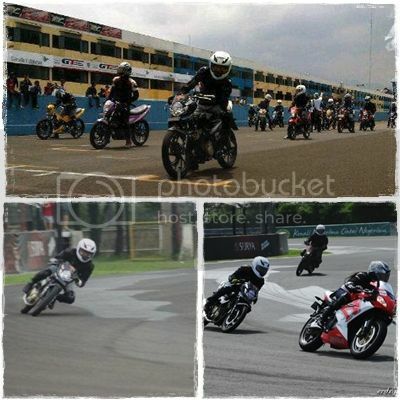 Once upon a time, me and my fellow satria riders took part in an open track day. During afternoon break times, the 402 meters drag session was inserted as complementary part of the training. And it was just incidentally happened, when one of my buddies confronted a Ninja 250R rider at a start line, and guess what, he slightly won the battle! Tough duel on the middle of 402 straight. The screenshoot not convincing enough ? Give me your best guess. What was the specification of this Satria/Raider/Belang? A 250cc extreme modification?? Maybe 200cc?? or 187cc?? Hehe, i am sorry to disappoint you, but the only major changes in the engine configuration was only a 6mm Stroke up. The rest were just some simple plug n play changes like carb, cdi, and exhaust. You must be already know, that the original (OEM) Cylinder Displacement of Suzuki Satria aka Raider R aka Belang R is 147cc (62mm bore x 48,8mm stroke). So then Wildan (names of the owner) installed a 3mm up stroker pin (cost about USD40 for kitti racing brand -others brand like LHK or kawahara even cheaper) while preserved the stock piston. Up and down, the total stroke now increase 6mm. So the engine configuration changes to 62mm bore x 54,8 stroke (165cc). Need to mention also, both bikes are daily use motorcycles, not a competition / racing bikes. It was not clearly known, what exactly the spec of the Ninja 250R was, the rider left immediately after the duel. But as far I knew, most of the bikes participated in this track day, have some tuned up at least on the Carburetor, CDI, or Exhaust Pipe. The Satria FU also not a straight track /drag specialized. With the same engine, this FU was also able to bear ‘engine break’ effects when it used for cornering session. Something that usually feared by a stroked up engine. Wildan and his Satria also succeed to won a race when we competed each others in Satria FU ‘one make race’ on that track day session. For you Raider|Satria|Belang users who might have the same wish to feel the similar performances as Ninja 250R on your bike. Now after reading this article, i hope you at least get some clue of what should be done to make your wish comes true. This article is english version from the original article previously wrote in Indo language; “The story of Blackpearl| Satria FU165 cc Lari setara Ninja 250”. Like this article? Please don’t be hesitate to hit the “Like” and “Share” button below. Have some comments? Feel free to share your thought with me in the comment section. 30hp Satria FU|Raider|Belang for Daily Use, why Not? 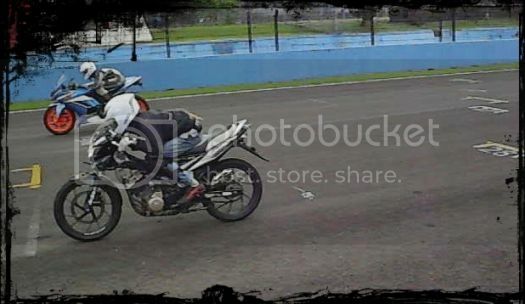 Sudah test motornya dengan Kips RR drag race? btw..thx ya dah mampir bro ewin..
itu stroke.. kitty… plug and play bro? atau butuh penyesuaian lagi dalam pemasangannya? Sir, did u do anything to your piston or did u just use a spacer? please reply to my fb account I'm planning to buy kitti 2.0 or 2.5 stroker pin. hello…sorry for my late response,,found ur comment just now. anyway, since its not my bike, i dont know much about the technical aspect. i'm not sure what u mean by spacer? a additional gasket on sylinder block? ooo…ok…if it so; yes he use a spacer. Just confirms what we already know- the Ninja 250 is heavy and slow, OK for posers but not for racers. wah klo bgitu motor kita sama bro..
sir. stroke up cant harm the engine sir if daily use ,, or tour? can u give me a set up for long run? what con rod did they use?